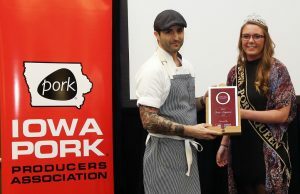 (Clive, Iowa, January 23, 2019) – Chef Nick Marino of Park Street Kitchen in Des Moines took home the 1st place honors – or Chef Par Excellence – at the Iowa Pork Producers Association Taste of Elegance competition. This year’s contest, held annually at the beginning of Iowa Pork Congress week, challenged chefs to prepare an entrée featuring fresh pork belly. Des Moines chef Nick Marino receives his first place award from 2018 Iowa Pork Queen Jordan Travis. The IPPA Taste of Elegance competition and reception kicked off the 47th annual Iowa Pork Congress. ← High Risks or High Rewards?